NYC is a union town! Join Local 802 on Saturday, September 8 as we celebrate our strength and pride as musicians – and as part of the NYC labor movement. The Local 802 contingent for the 2018 NYC Labor Day Parade gathers at East 44th Street between Fifth Avenue and Vanderbilt Ave at 9 AM, and the parade steps off at 10 AM. When you arrive, look out for the Local 802 float. We’ll have breakfast, coffee, and Local 802 t-shirts to give out as we spend a fun day showing our musician pride! RSVP to the Facebook event here. Questions? Contact the Organizing Dept at 212-245-4802 or email Organizer Sarah Koshar. 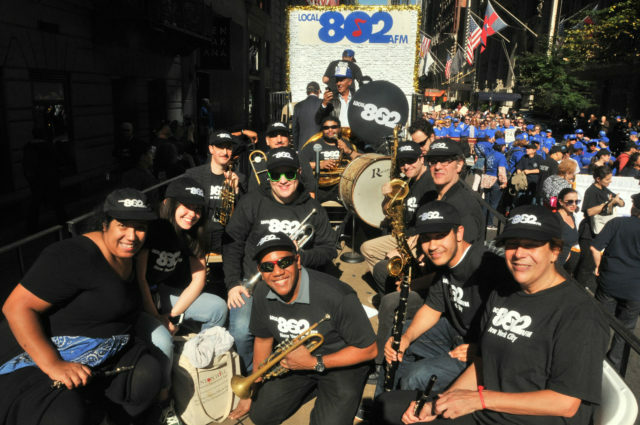 Local 802 musicians at the 2017 NYC Labor Day Parade; photo by Walter Karling.